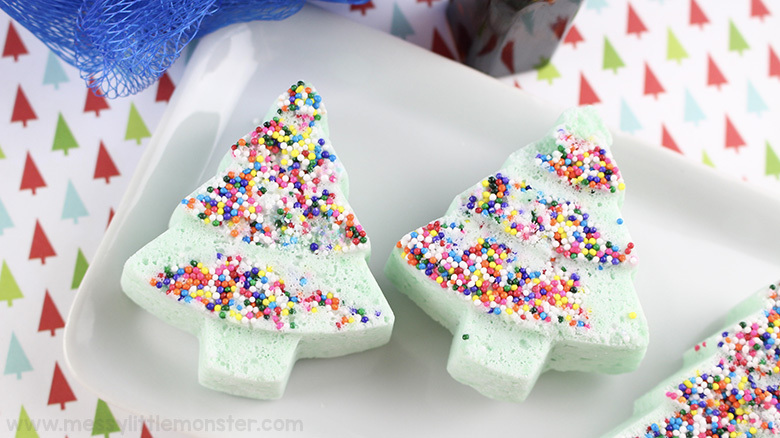 These Christmas bath bombs make the BEST handmade Christmas gifts! 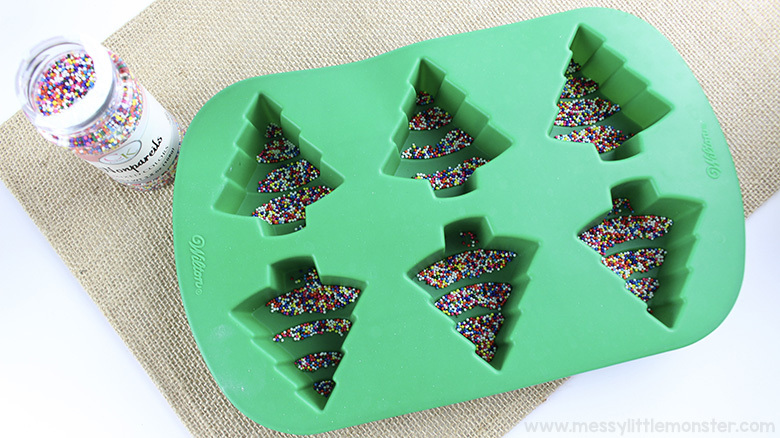 They're shaped like cute little Christmas trees and give you another excuse to use sprinkles! Kids as young as toddlers and preschoolers will love helping you make these easy handmade Christmas gifts. Just scroll down below for easy step by step directions to make your own bath bombs for Christmas! Be sure to also check out our other homemade Christmas gifts! With Christmas heading our way before we know it, we have been busy gathering Christmas gifts for our family and friends. If you want to make gifts rather than buy them these Christmas bath bombs are a GREAT handmade gift idea. Personally, I love handmade Christmas gifts the most since it's more meaningful than something from the store - bonus points for it being cheaper too! 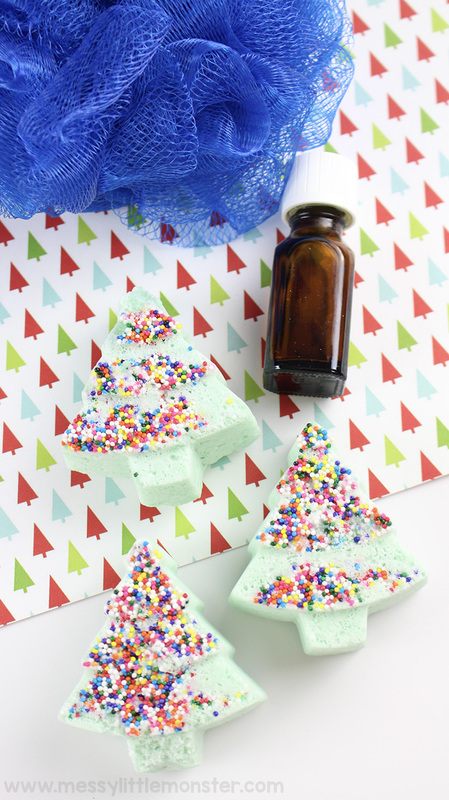 These Christmas bath bombs are a great handmade gift to get your kids involved with - they are so easy to make that kids as young as toddlers and preschoolers can get involved! 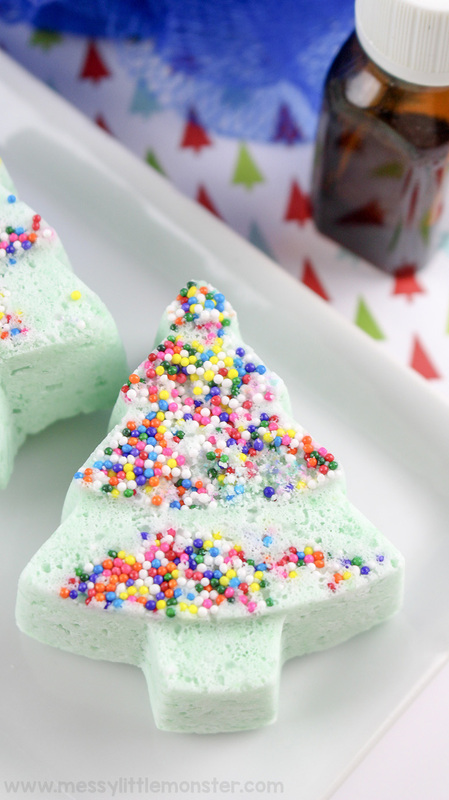 Just scroll down below for the directions to make your own bath bomb for Christmas! Before you get started, gather up all your ingredients and supplies. 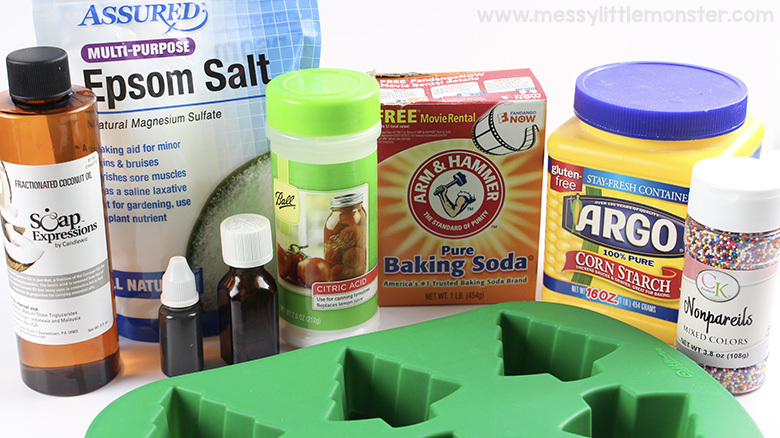 This will make the process of making your Christmas bath bombs so much easier! 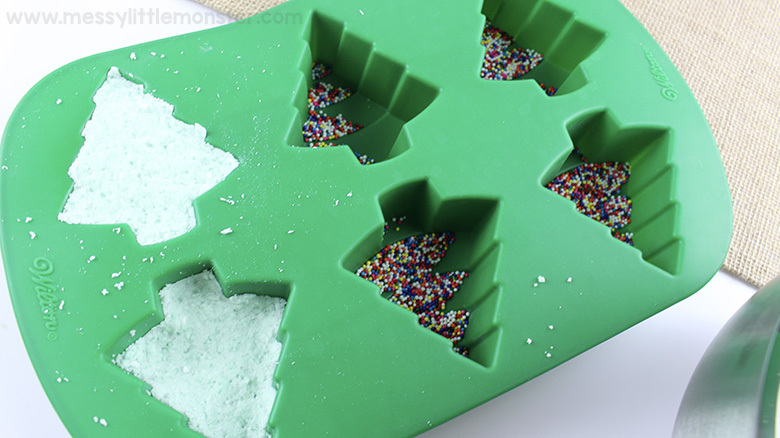 To get started, prepare the Christmas tree mold by sprinkling 1 teaspoon of sprinkles into each Christmas tree mold and then set aside. Next, it's time to combine the ingredients! 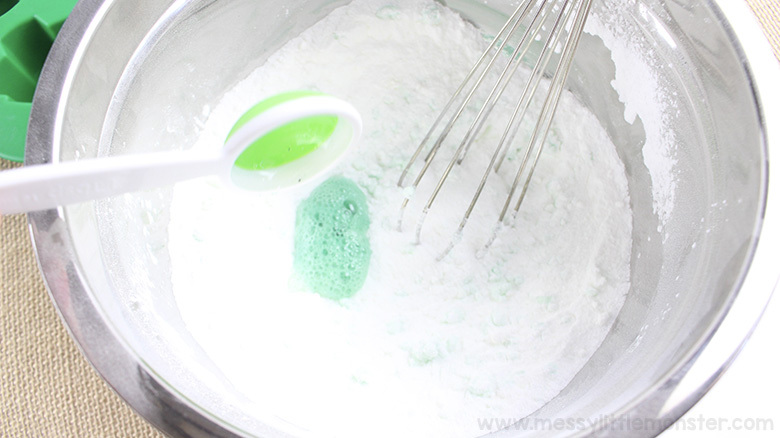 In a metal or glass mixing bowl, add the baking soda (bicarbonate of soda) , citric acid, corn starch (cornflour), and epson salt. Whisk to combine. 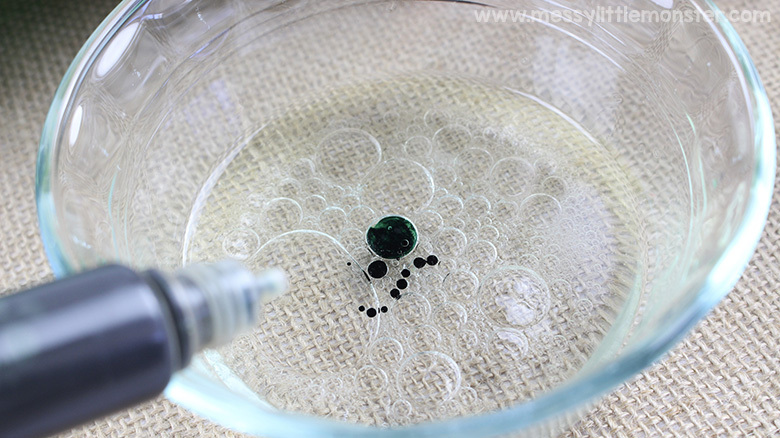 In a separate small mixing bowl, add the water, coconut oil, essential oil, and soap colourant. Stir to combine. Then, slowly add 1 tablespoon (at a time) of the liquid mixture to the dry ingredients and whisk each time in order to avoid to much bubbling and becoming activated. You want it to resemble damp sand and hold together when you clump it in your hands. Once you have the mixture ready, transfer it to each tree mold - only filling about 3/4 full so there is room for expansion. Press firmly into each one and allow it to dry overnight. 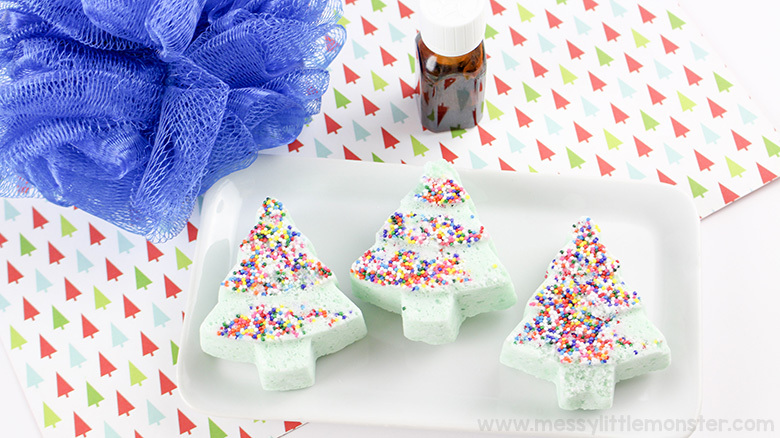 Now it's time to prepare these Christmas bath bombs for gifting! Pop them out of the mold and wrap them in cellophane and finish off with a cute Christmas ribbon. 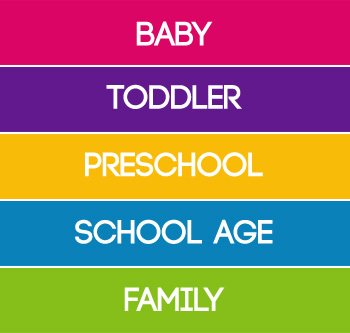 Store them in an airtight container until you are ready to gift them to your friends and family. To use: fill your bathtub with warm or hot water and drop the Christmas bath bombs into the water and watch them dissolve! Enjoy a relaxing bath as wintergreen fills the air. 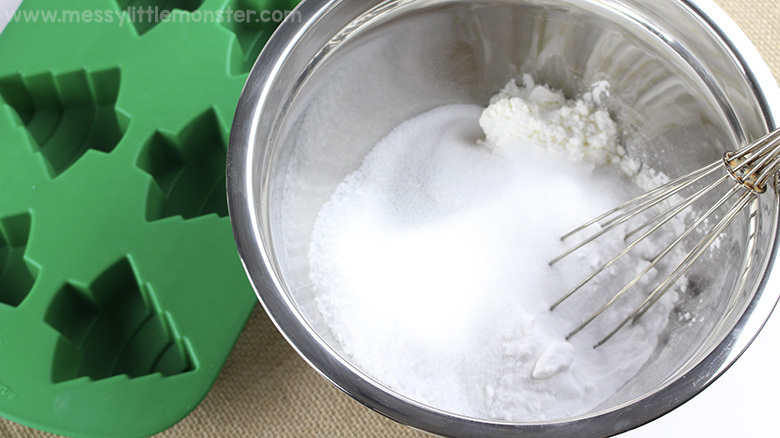 The coconut oil will moisturize your skin while the epson salt and baking soda soothes tired muscles. 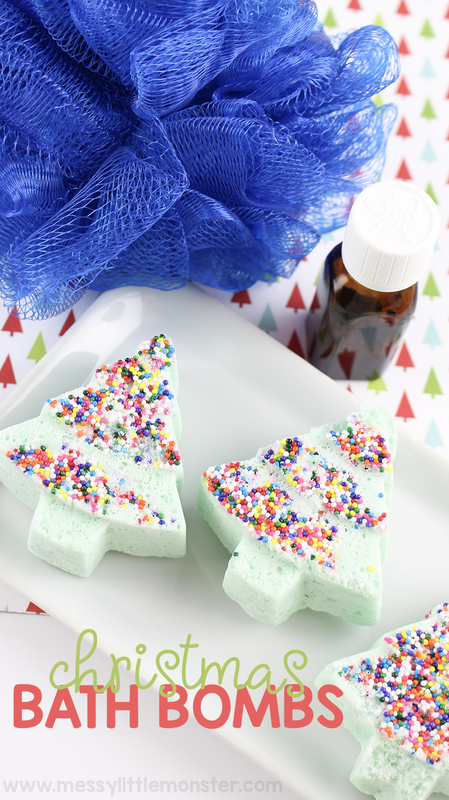 We hope you enjoyed making these Christmas bath bombs! They make great homemade gifts for friends and family, but don't forget to keep one for yourself too! They are soooooo relaxing in the bath. 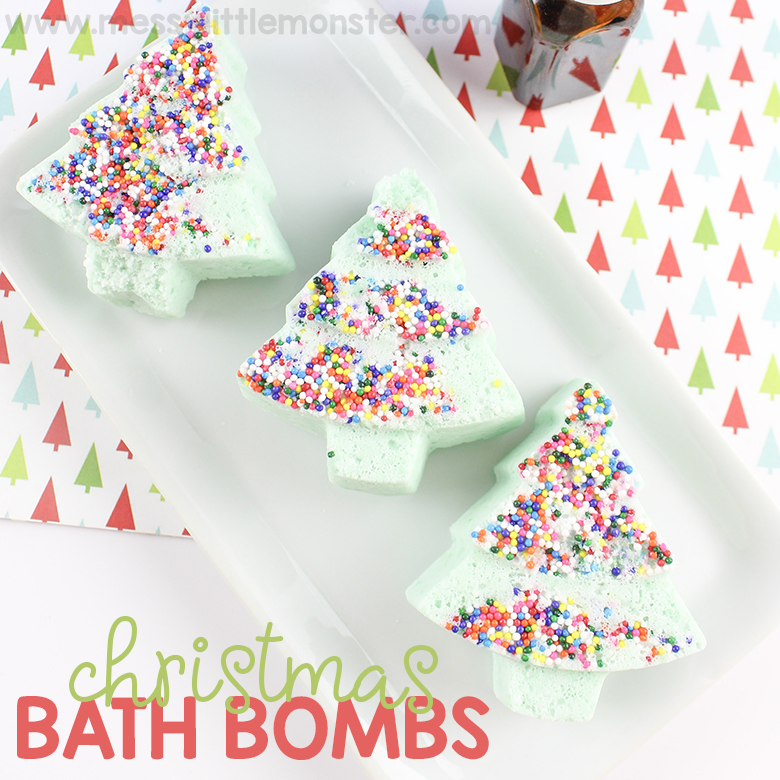 These are great if you want to make your own bath bomb to gift for the holidays.